The competition opened up a previously closed area of Gjøvik called Huntonstranda to 110,000m2 of new housing with the associated infrastructure and complimentary programs. In the competition area a new Culture House of 11,000m2 is also being considered. The vision for Gjøvik is a ‘‘pulsing city full of opportunities, beautiful architecture, pedestrian, attractive housing, and a versatile cultural and commercial environment’’. Gjøvik centre lies close to Mjøsa lake but turns its back to the water. Large industrial area and infrastructural barriers mean there is very little daily contact between most inhabitants of Gjøvik and the lake. Its no secret that proximity to water affects living quality and property prices, also water is an unbeatable city life activator, appealing to all types of people. Inviting water into the development of Huntonstranda has been fundamental in our project since the beginning. We have done this physically in the forms of canals, wetlands and flooding dams, as well as creating generous and varied connections to Mjøsa. Our proposal, Hunton Kanalby, is not a new city centre but complimentary to the centre, built upon the existing commercial hierarchy radiating out from Storgata so that these two area do not compete with each other. 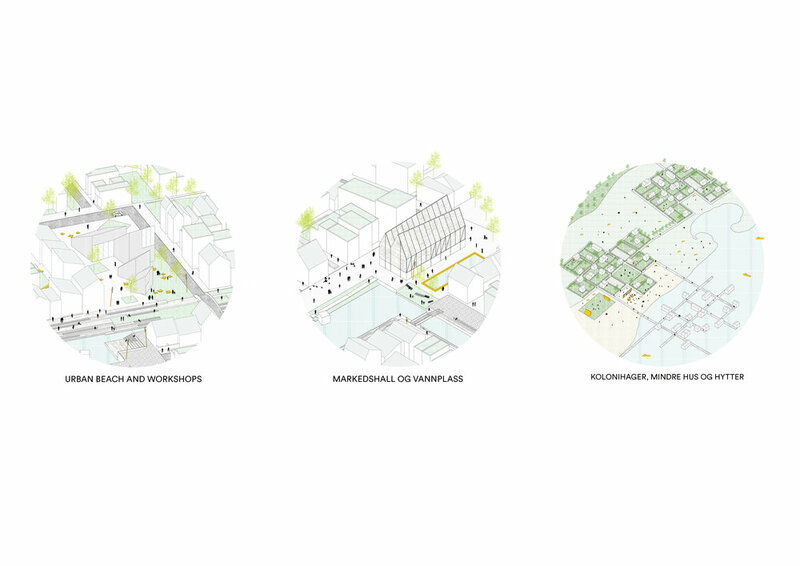 However our proposal takeas advantage of the idylic loaction to create a new neighbourhood with a close connection to the water, dominated by green and blue public spaces. An area with a wide variety of building typlogies to guarantee a varied and mixed community and versatile commercial premises. An area well connected to the rest of Gjøvik so it can be easilty integrated into the existing city fabric offering a new district for the whole city.